Putin: World Order: New Rules or No Rules? Welcome to Truth or Consequences: EoP New Rules or Masonic War is Peace No Rules: Kremlin: Meeting of the Valdai International Discussion Club: The World Order: New Rules or a Game Without Rules; Club Orlov: Putin to Western Elites: Play Time is Over. Valdai 22-24 October 2014: New Rules or No Rules: All speeches: Full: 02:58:34; Putin Speech: Full: 41:31; Excerpts: War & Peace: 32:03; Key Quotes: 05:39; Russia Today. » IG: 16-08-16_vputineopwipsocialcontract; 17-04-11_eopntegmru-eoporwiprules; 15-07-27_putinbear-eoptruth-wipconsequences. – Michael Hoffman: Secret Societies and Psychological Warfare. Ecology of Peace New World Order Social Contract Options: Applicants. Masonic War is Peace IG: » 14-03-03_wipscarcity-conflict. Comparison of differences between EoP and Masonic War is Peace available at: MILED Sign Up Original: Wayback Machine; Archive: archive.is/y3ZGO. » eop-v-wip: eop-v-wip-law; eop-v-wip-academia; eop-v-wip-religion; eop-v-wip-psych; eop-v-wip-charity. 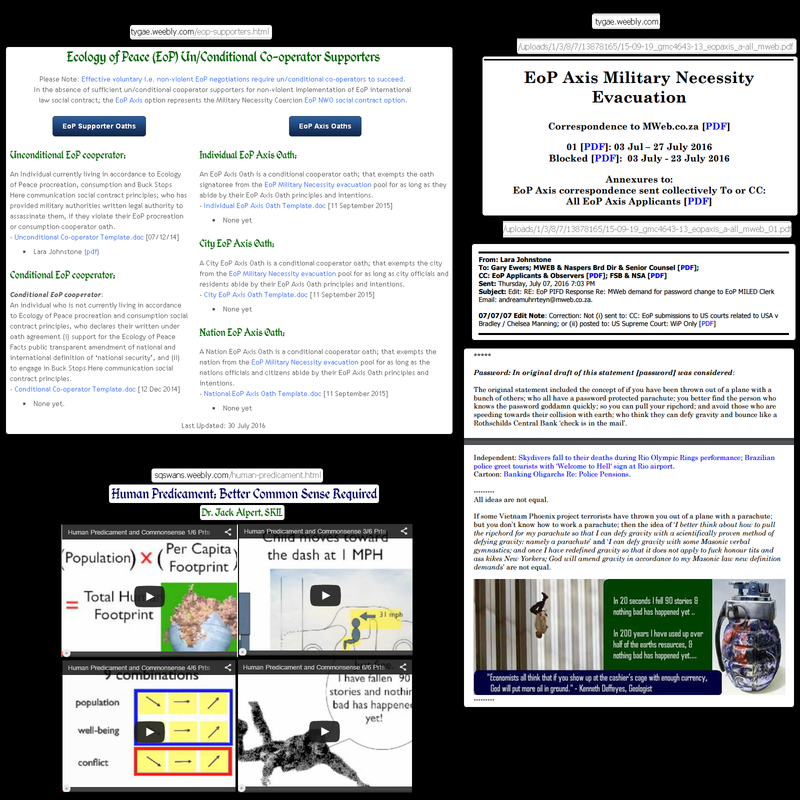 » eop-nwo-sco: eop-applicants: eop-cooperator: ss-defcon: military-gospel. 16-07-30_EoPOathParachute-WiPNoParachute [Info]: EoP Supporters Oaths and EoP Oath Templates; WiP Falling Man: EoP v WiP NWO Negotiations: MWeb [PDF]: Re: 07 July 2016 correspondence; Re: MWeb Demand for Password change to EoP MILED Clerk Email: andreamuhrrteyn; EcoHomeSchoolers:Human Predicament: Better Common Sense Required. * Aex ELF Potato-Island-Love Story: New EoP-Gotit Rules or No-Los-Pepes Rules?. * Updated: PutinBear-NewNoRules_EoPTruth-or-WiPConsequences [Info]. Excerpt: 17 January, 2015 1:58 PM: Subject: RE: VPutin New-or-No Rules Q: A: Egyptian Pres Al-Fattah Al-Sisi at Al-Azhar: We Must Revolutionize Our Religion: SF44: Observations and Interpretations: Pootin Bear: Masonic elite sawing at branch they sit on; in Former MILED Clerk Ecology of Peace v War is Peace culture – Swansee Psychotronic Legal Masonic Mystical Toponomy, Flattery and Twilight Language Psychological Warfare War games – New World Order Conference Negotiations. 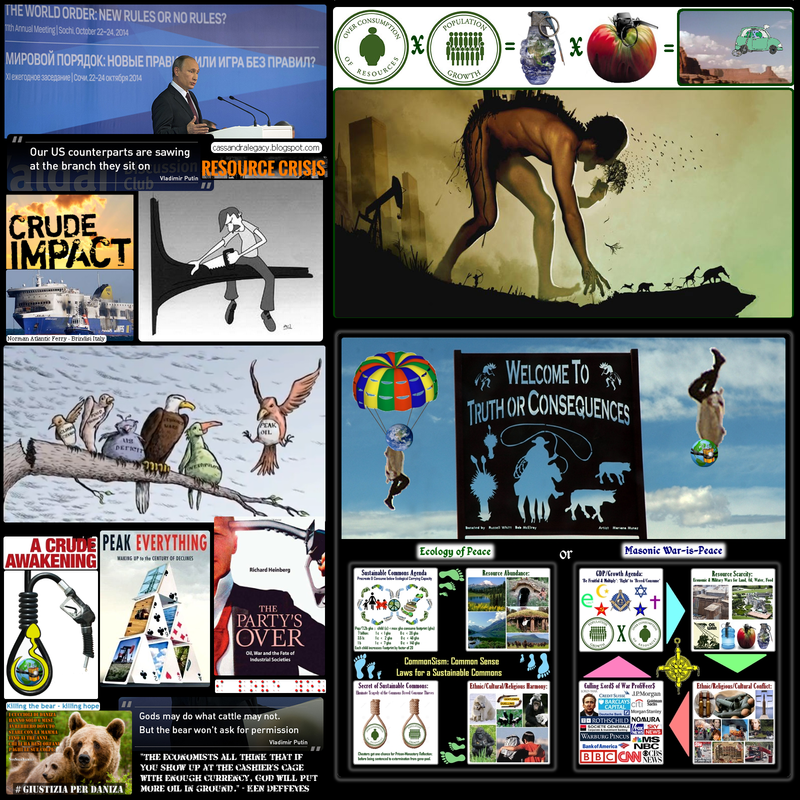 […] Resource Depletion Scarcity Conflict: Military Gospel According to Homer Lea; Teddy Roosevelt Resource Conservation: The conservation of resources is the fundamental problem. Unless we solve that problem, it will avail us little to solve all others. Welcome to Truth or Consequences: EoP New Rules or Masonic War is Peace No Rules: Kremlin:Meeting of the Valdai International Discussion Club: The World Order: New Rules or a Game Without Rules; Club Orlov: Putin to Western Elites: Play Time is Over. Valdai 22-24 October 2014: New Rules or No Rules: All speeches: Full: 02:58:34; Putin Speech: Full: 41:31; Excerpts: War & Peace: 32:03; Key Quotes: 05:39; Russia Today. […] Valdai 2014: Putin: World Order: New Rules or No Rules?